Actually...it was a woman and she seems totally oblivious. It was frustrating for me because there wasn't a thing I could do to right them in the box or rearrange the towel. I did ask her to be careful and suggested she put a ...do not tip...note on the box, which she did. My biggest worry is not how they feel in the box but how they are handled while on their way. I'm sure I will get disagreement from many here when I say this BUT for the most part pigeons are far from "delicate". 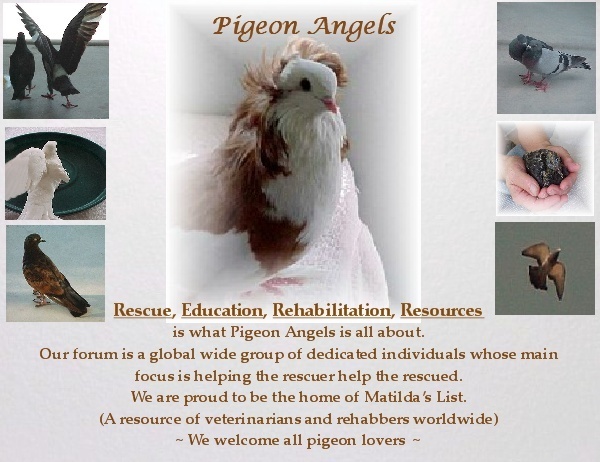 I do understand that there are those who may be more delicate than others becuase of health or handicapped reasons but I am amazed almost daily how some of the oncethought of handicapped pigeons who live here are no different than the "healthy" non handicapped birds. Many pigeons have been put through devil and rebound back to happy healthy birds. I understand your feelings & share that worry too. Certainnly my feelings are clouded by the experience above and also by one I observed a few years ago. While visiting a friend, she received a phone call from the PO that her birds had arrived. Until then, I was not aware birds could be shipped through the PO. I went with her to pick them up. When she claimed them, the box was battered, dented and even had a tear in it. It looked to me like the box had been thrown around. The birds inside were OK but freaked out. Supposedly they were hand raised, tame young birds but they never acted tame after that experience. * I'm sure I will get disagreement from many here when I say this BUT for the most part pigeons are far from "delicate". ** Many pigeons have been put through devil and rebound back to happy healthy birds. What I love about our group is that we can disagree and discuss without all the inappropriate and unnecessary comments that often times accompany a disagreement. ** It is true that pigeons, for the most part, aren't 'delicate'. And many do overcome what seems like the worst case scenario ever. However . . . The fright and uncertainty of what is going on is still there when they are placed in box, then have the box shut tight and moved about, sometimes not so gently. They have no idea what's happening on the outside. I can only imagine the fear factor they are going through. Chuck has mentioned several times how he would love to have a setup where he could transport birds throughout the US. I agree that it's OK to disagree and all opinions are important. It's by listening to all sides that we can alter our own opinion or validate it depending on each individual situation. That would be so cool if Chuck were to do a Pigeon/Dove transport. I'd even put on my Pigeon outfit and buy a ticket. No boxes for me please. This would be fantastic as long as the cost could be kept resonable. That's the whole thing. Diesel fuel is out of sight, just to name one drawback. If we were to win the lottery, Chuck would get things rolling ( ) and there would be little, if any, charge to the 'customer'. One thing is for sure, whatever pijjies he transported would be livin' the easy life while on the road. We have Beautiful and Blueberry that can attest to that.